MEDT200	| Write the first review! The Spirit Treadmill medical MEDT200 with incline and decline features one speed control motor, an incline motor and a decline motor. 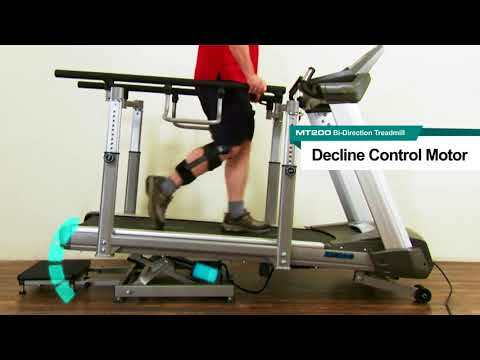 Three motors together help users to achieve bi-directional training in combination with uphill or downhill protocols. Adding more versatility to exercise and therapy options, the parallel bars, deck height, and belt speed acceleration are adjustable in small and precise increments. Biofeedback is offered for clinicians to accurately assess user gait performance. Feedback includes the symmetry index, which is particularly outstanding for clinicians to condition users' step and cadence. As a result, this treadmill is ideal for pediatric exercises, neurologically impaired patients, and other populations.